RJSC Name Clearance Certificate should collect from The Register of Joint Stock Companies and Firms (RJSC) is the Govt. authority for registration of joint Stock Company in Bangladesh. 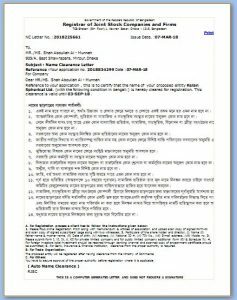 RJSC company registration first stage is received Company Name Clearance Certificate and prepared company’s Memorandum of Association & Articles of Association to submit these documents at RJSC office for receiving company Incorporation Certificate of Joint Stock Company Bangladesh. RJSC (Registrar of Joint Stock Companies and Farms) is the legal body for issuing all kinds of certificates and documents of Joint Stock Company Bangladesh such as Name Clearance Certificate, Incorporation Certificate, Certified Copy, Share Transfer, Share Allotment and monitoring company documentation as like annual audit submission, return filing and so on. Same company name is not acceptable, its hearing sound, written style etc. Similar name of international company, organization, social & Cultural organization are not acceptable. Not acceptable existing company, business body, Social, Cultural, Entertainment & Sporting organization’s name. Name could not same Govt. Organization or Company. To take freedom fighter related name for your company must be essential approval of Freedom Fighter Ministry. Not acceptable similar of Govt. development program or development organization. Existing political party’s slogan, name and program not acceptable. Must avoid Rebuke, Slang word …. Name could not harm Social, Religious and national harmony. In case of long established (at least 10 years) Social institutions, if they want to register after their current name, they have to apply for name clearance appearing personally along with board of committee’s resolution. Must be taken Ministry permission of Social, cultural & sporting Organization for Limited company. Name clearance is not final name for Company Registration, RJSC holds power to change. Receiving name clearance certificate, we prepare Memorandum of Association & Article of Association. The Memorandum of Association describes all kinds of business activities and indicates number of shares of each Director and Shareholders of the company. The director, shareholder, managing director, Chairman signed on Memorandum of Association holding number of shares of the company. The Register of Joint Stock companies and Firms (RJSC) Name Clearance is the first step to register a company in Bangladesh.